Quantum Break’s launch on PC has not been flawless, even as it is Microsoft’s “best selling new-IP of this generation.” It’s broken expectations, and with that comes the usual massive variety of computer setups, not all of which were tested for. Frame stutters, memory leaks, crashes and a lack of options have all been common complaints, now addressed by Remedy – including one fix that involves installing a month-old Geforce driver. How does Quantum Break compare to the best PC games 2016? In a massive forum post, Remedy first thanked everyone for making the game a success, then apologised for the issues being experienced particularly by the PC community, but in relation to the game as a whole as well. They say that a rounding error was introduced late into production that is affecting framerates and they are already working on a fix, as well as a GPU memory leak issue that is slowing rendering rates. In the mean-time, they recommend restarting the game if you encounter issues during a play session, which should at least help to identify what the problem is even if it doesn’t solve it. They also, oddly, have a section on preferred graphicrs drivers. For AMD this is the Radeon Software Crimson Edition 16.4.1 which, as far as I can tell not being an AMD-guy, is part of the most recent package. So far, so normal. However, for NVIDIA Geforce they’re recommending 362.00 – a driver from the 1st of March that has been replaced twice, with the current version being 364.72. 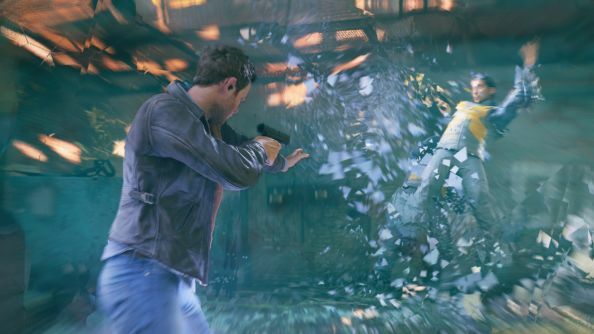 Moreover, 364.72 promises “the optimal experience for Quantum Break” as part of NVIDIA’s Game Ready program. This is the second time in as many days we’ve seen an older NVIDIA driver be recommended over a new one for performance reasons, with Dark Souls 3 apparently running better on a Bioshock Infinite-branded driver from 2013. Odd. Remedy also say they’re looking into adding a main menu quit option after complaints, despite it being an in-built part of Windows 10 to use either Alt+F4 or moving the mouse to the top of the screen. They also say that Microsoft will be updating UWP in May to allow “for developers to disable v-sync and adding support for G-Sync and Freesync monitors” which should fix some further problems. They’re also looking into adding more options, especially to remove the film grain effect that was an artistic choice but some players aren’t a fan of. Have a read of the full thing for some further details, as well as Xbox One-specific fixes. Whose got thoughts on Quantum Break? Let us know viaBetterCritic, it hungers for your words.